We’d been curious about the quality of Japanese food in Taiwan because of their historic ties with Japan, so we made sure we made a visit to at least one Japanese restaurant when we were there. Udon noodles are handmade on site, if my understanding of Chinese is correct. We’re not big on sight seeing, so Maokong was not a place anyone particularly wanted to visit, were it not for the lure of cute Hello Kitty themed cable cars (‘mao’ in chinese means cat, hence the Hello Kitty Theme). We’re a sucker for cute things! Taipei has these awesome public rental bikes everywhere- if only I had a bit more time, I’d definitely have a go cycling around! 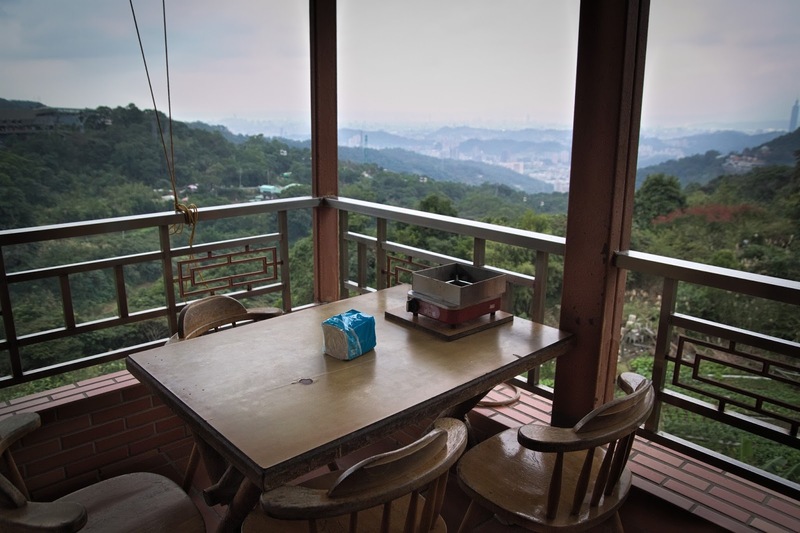 Anyway, Maokong is situated on a mountain and is known for its tea houses. You can get up there either by bus or on the Hello Kitty themed cable cars, which are an attraction in itself. They’re a half an hour ride up with plenty of nice scenery on the way, and a couple of stops for those who are a little more adventurous- and all for a ridiculously cheap price (~$2AUD). We’ve decided to try out one of the tea houses, but we’re side tracked by the little food market just next to the station. There’s street food just about everywhere in Taipei. And it’s like the night markets all over again! There’s just about every night market staple in this little cluster of food stalls. Including our all time favourite- Taiwanese sausages! We’ve had our Taiwanese sausages multiple times in the afternoon and at night, so it’s about time we start the day with a sausage! It’s easy to navigate around, with basically one long windy road along the mountain, with tea houses scattered along. We’d been wandering around trying look for breakfast, but there isn’t much open during the morning so we kept walking and walking until we walked past this very vintage looking cafe and decided it’d be something different to try! The cafe certainly has an interesting vibe, with 70s decor complete with checkered tablecloths, vintage lamps and all that. They seem to be quite serious about their coffee, with an array of coffee making equipment operated by a dedicated coffee master. The drinks menu included on option which I was pretty sure said ice-cream but surely no-one would order ice-cream for breakfast right? Curiosity got the better of me, so I ordered it, half expecting a milkshake or something similar only to actually receive an two small scoops of ice cream with my meal! We’ve been told that the Palace Hotel is a restaurant which you must go to when you’re in Broken Hill. Not only is it one of the only two places where it’s legal to play two-up all through the year, but it’s also one of Broken Hill’s most iconic building, where Priscilla was filmed. It’s also surprisingly busy, as we found out when we rocked up only to be told there’d only be a table available at 8:30. Luckily there’s a bar and pool table to keep us occupied whilst we wait, and if you go to the hotel side of the building, there’s quite impressive artwork to be seen on the walls! The dining space is rather fancy, with a really unique outback atmosphere from the bush paintings on the wall. Service can be slow when it’s busy, but we’re not in a rush so it’s not an issue for us. It’s not everyday that we order fries for entrée, but their fries with herbs and yoghurt do sound rather intriguing so we give them a try. It’s certainly a different way to have fries, as the mixed herbs impart an interesting taste to the fries and goes well with the yoghurt. We do wish that there was a little more yoghurt, or that it was served on the side though. The black ling fish is another curious dish, named so because of the Cajun spice coating on the fish that gives it a rather dark appearance. Although we really enjoy the flavours, it’s rather dry, and the meat not quite as tender as we’d hoped. The side of creamy mash and seasonal veggies (asparagus and brocolini) are great too. We’d originally intended to order a tasty eggplant dish (can’t remember what it actually was) instead of this but it had sold out so after some indecision, we settled on the lamb rump. And we’re glad we did order it because we were quite impressed by the lamb, which was cooked until beautifully tender. The bed of veggies and beans balanced the flavours well, and we love the sweet balsamic glaze which seemed to tie everything together. The dessert platter was the perfect size for the two of us and it meant we didn’t have to choose from the many tempting dessert options on the menu. The pistachio macarons didn’t have much of a pistachio taste and were on the rather sweet side, but we did enjoy them. The lime cheesecake was light and refreshing, which was quite a contrast to the other components. But out favourite was definitely the chocolate mousse in the chocolate cup (with a chocolate spoon too! )- you’ll probably want to share, otherwise it’s chocolate overload! Because we’re so impressed on our visit, and we had yet to try the eggplant dish, we return the week later for our celebratory end of week dinner. Alas, their whole menu has changed (apparently it does this once every couple of months) and the eggplant is nowhere to be found, nor are a couple of other dishes that we were hoping to try. We’ve noticed quite a few people order calamari in all the restaurants we’ve visited so far in Broken Hill, and were wondering whether it was a Broken Hill thing, so we try the entrée of fried calamari. It’s a gluten free version, with a rice flour coating, so it only has a light crunch which actually works quite well as the calamari is rather soft. Served with onion, lemon and roquette, it does make for quite a satisfying entrée! There’s not an awful lot that we’re excited about on their new menu, but luckily, there’s also the handwritten specials board, though my short-sightedness meant that it took me a while to figure out what it actually said. The slow cooked lamb shank is quite tender, and I loved that it was served with a generous amount of veggies. Between the lamb rump from last week and this lamb shank, I’d say I enjoyed the flavours of the lamb rump more though this one was also really enjoyable! The dish named after the restaurant- you’d think it’s be amazing, but unfortunately, the pork crackling wasn’t crispy at all and rather chewy actually. The apple and pear chutney is a nice accompaniment, as are the roasted potatoes and seasonal greens, but the pork belly itself was such a disappointment! The dessert menu hasn’t changed much, but our waitress recommends a dessert that isn’t on the menu and does an excellent job in describing it in a really tempting way. And when it arrives, it looks every bit as delicious as she made it sound, with delicious chocolate base, peanut cream filling and a generous scatter of caramelised peanuts on top. And last but not least, the deep-fried ice cream, which is also recommended by our waitress! It’s two small scoops of vanilla ice cream, deep fried in a crunchy coconut and bread crumb coating with a drizzle of mango puree and cinnamon. It’s quite similar to the version that is served in the restaurant I work at, although the combination of fried ice cream, mango puree and cinnamon is definitely novel. We’d been given a little town tour by the uni on our arrival to Broken Hill, some 5 week ago now, and had driven past this cute little corner takeaway store. 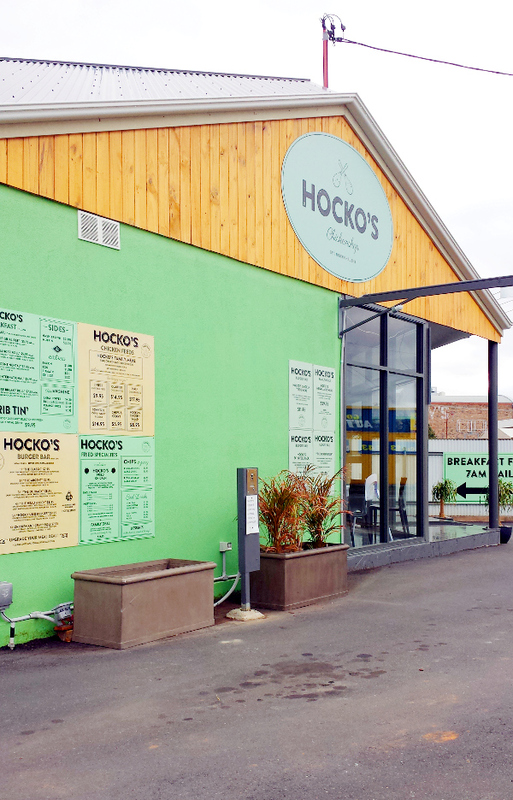 It’s called Hocko’s Chicken Shop, but we had misread it to be Hocko’s Chicken Soup so when we rocked up on a cold day expecting some warm chicken soup, we were a little surprised to when we read the menu. There’s no chicken soup in sight, but there is plenty of fried chicken and burgers which sounds just as good! We’d eaten not too long ago, so decided to share a burger, and the ‘Outback burger’ seemed so fitting seeing as we were in the outback! We’re glad we decided to share as it’s quite a filling burger, with a big slab of fried chicken breast in the middle, deep fried til golden brown and impressively crispy. There’s also plenty of filling between the toasted bun, with smoky bacon, cheese, tomato, beetroot, lettuce and bbq sauce. And it’s every bit as tasty as it looks! And you can’t have a burger without chips so we order a large chips and gravy, which is deep fried to order so it’s very hot and crispy. We’re quite fond of the gravy also, and we’re glad they’ve given us a pretty generous serving! There isn’t a great lot of places open at night in Broken Hill- the pubs are really the only the place to go. We’d been to Tydvil Hotel previously with friends for drinks but spied the waffles from the bistro at the last minute and decided to go for some waffles instead of a drink- and they were so good we decided we’d come back for a proper meal! Tydvil bistro is a small dining area next to the pub. It’s nicely set up, but like any pub bistro the service is minimal- grab a table, grab some menus, order at the counter and wait for your food to come. They specialise mostly in steaks and schnitzels, with a complete menu dedicated to schnitzels and various toppings you can add on top. Seeing how popular the schnitzels were, we decided to get one each. The basic chicken schnitzel is $19.50 and comes with gravy and a side of chips and salad or roasted vegetables. But of course, we don’t want to boring like that so we choose from their 20 or so different toppings available. It’s not everyday that you eat schnitzel with avocado so we try the King Avocado topping ($4). It bears a startling resemblance to a Hawaiian pizza, with a topping of not only avocado, but also bacon, pineapple, sour cream, sweet chilli sauce and melted cheese. And it makes for a rather large serving size too! Because there is a heap of topping, you don’t really notice the avocado but the combination of all the flavours is quite tasty. We do find it rather salty though, as the bacon, cheese and schnitzel are all quite salty themselves! And how can one pass a topping named ‘Chef’s special’? It’s a tasty combination of squid, chilli, lime and cherry tomatoes in garlic and white wine sauce. The sauce goes quite well with the perfectly cooked squid, with a slight zing of lime making it taste rather fresh. It does however, taste a little odd with the schnitzel as the heaviness of the schnitzel contrasts greatly with the lightness of the sauce. There’s no dessert menu, but there are three different waffle flavours scribbled on the blackboard behind the counter. We’d tried (and loved) the strawberry and banana version last time, so we decided to go with the English Toffee variant this time, which comes with almonds, cashews and salted caramel. Be prepared to share, as their waffle portions are rather large, with three big scoops of ice cream. The waffle is nice and crispy, and we love the sweetness of the English toffee as well as the crunch of the nuts. Definitely a very satisfying way to end a meal!